For the past several years I have been a Research Assistant Professor in the Biological Evidence Section at the National Center for Forensic Science at the University of Central Florida (UCF). I have been involved in forensic DNA and biological evidence research for even longer (~17 years)! Forensic research is truly rewarding because you get to work on developing new techniques that will potentially help the forensic community and aid in the resolution of criminal matters. A large focus of our research involves developing new techniques to improve DNA recovery from sexual assault evidence, particularly late reported sexual assaults. This is an area I am very passionate about and we strive to give ‘every victim a voice’ through our research! Through research, we are trying to make a long-term change for all victims with better forensic collection practices. However, working in the lab it’s sometimes easy to forget that there are people behind the samples you work on every day. Therefore I wanted to pursue additional ways to make an impact with actual victims and survivors in my own community. This is what led me to becoming a VSC volunteer! At first, I did not know what to expect. 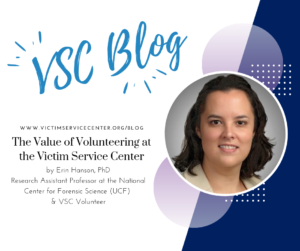 I thought I had a good idea on what a victim service center provided and I was not sure what I could do to help exactly – probably the same as many people might feel when thinking about volunteering with such an organization. Would I be able to work with clients directly? Would I have enough knowledge and the right personal skills to interact with survivors and clients? After my initial lunch Meet & Greet and interacting with the staff – I had no doubt this would be a truly rewarding experience and that no matter someone’s background everyone has their own strengths and skills that they can offer. First – you are not an advocate upon walking in the door, nor are you expected to be one. You might think that this means you won’t interact with clients directly. But this is not the case! I volunteer in the VSC office on Mondays in the advocacy department assisting clients and advocates. Being in the office to help with answering the phone, providing information to clients, reaching out to potential future clients to let them know about VSC services – it all has a major impact and you are truly interacting with the community. Anything volunteers can do to help the advocates and allow them to spend more time focusing on their clients is so valuable. So with proper training, a little bit of practice and the patience of the VSC staff (in answering my millions of questions) – you can handle anything that comes up! An even more rewarding experience has been participating in outreach events. These events allow the community to find out about VSC and the services they offer. Every event I’ve gone to has truly shown me the strength of our local communities and their dedication to community members! The number of people who have thanked us for our service, shared their stories of survival or described the help they received from VSC or other victim service agencies is astounding and makes you want to try to do even more for survivors and the community! It has been such an incredible experience to work with VSC and see firsthand, on a personal side, the people impacted by assaults and other traumatic events and to see an exceptional agency that works every day tirelessly in support of survivors and clients. My advice to anyone thinking about volunteering with VSC – do it!! It is truly a very special place with the most dedicated, warm and friendly people I have ever met! I look forward to continuing to work with them and getting involved in any way I can! 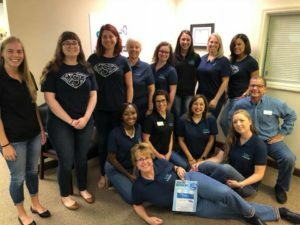 To get involved, head over to the “Get Involved” tab and complete our volunteer application to begin your volunteer journey with the Victim Service Center. Наша специализированная компания ООО КУОРГ Пермь организует новейшим методом видеодиагностикуинженерных систем, сетей хоз. бытовых, сетей хозяйственно-бытовой, инженерных систем, ливневой канализации и так далее. Видео/телеинспекция труб осуществляем спец камерой, которая передвигается по трубе и передаёт вид на телевидеомонитор и вместе с тем выполняется видеозапись изображения. Эта видиодиагностика позволяет узнать состояние стыков и стенок трубопроводов, места нахождения щелей, свищей и других дефектов, выявить засоры и инородные элементы, незаконные врезки и так далее. Телеинспекция также может быть применена и в случае приёма труб впоследствии выполнения строительных работ, ремонтных работ. Большим преимуществом устройства видеоинспекции несомненно является ее мобильность, легкость подхода к трубопроводу, а кроме того возможность получать видеоизображение внутренних деталей различных труб.